+++NEW+++ OCTOBER 6: CONCERT: Tangerine Dream, Notte Bianca Valletta (Notte Electronica stage), St. Elmo Square, Valletta, Malta. 9.30pm. +++NEW+++ OCTOBER 13: CONCERT: Tangerine Dream, Internet Festival, Teatro Verdi, Pisa, Italy. 9.30pm - 11.30pm. Tickets from 11 Euros. OCTOBER 19: Tangerine Dream THE PINK YEARS 1970-1973 CD boxset release date. Contains Electronic Meditation, Alpha Centauri, Zeit and Atem in card gatefold sleeves, c/w a poster in a clamshell card box. NOVEMBER 3: CONCERT: Tangerine Dream, 'Elektro-Beats Festival', RBB Sendesaal, Berlin, Germany. NOVEMBER 9: CONCERT: Tangerine Dream, 'Mira Digital Arts Festival', Fabra i Coats, Barcelona, Spain. DECEMBER 30: CONCERT: Tangerine Dream, ‘Hello 2019”, Zeiss Planetarium Bochum, Germany. 8.00pm. Tickets 39 euros. SOLD-OUT. 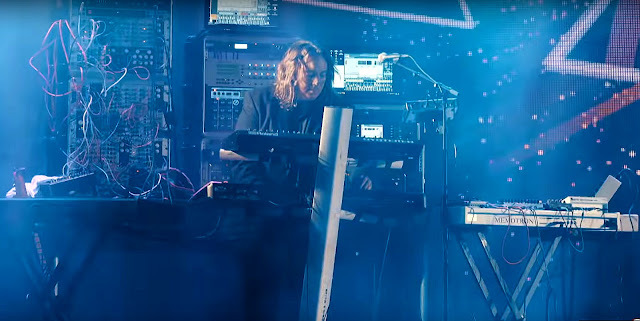 DECEMBER 30: CONCERT: Tangerine Dream, ‘Hello 2019”, Zeiss Planetarium Bochum, Germany. 10.00pm. Tickets 39 euros. SOLD-OUT. SPRING 2019: Ulrich Schnauss back-catalogue (studio albums) to be re-released as a remastered boxset c/w unreleased and rare material. Update: this will be released as CD, LP and downloads as well as a limited edition with a bonus cassette containing two improvisations. +++NEW+++ MARCH 13: CONCERT: Tangerine Dream, Barbican Hall, Barbican Centre, London. Tickets available from October 25, 2018. MARCH 14: CONCERT: Ulrich Schnauss, Thekla, Bristol. MARCH 16: CONCERT: Ulrich Schnauss, St. Paul's Church, Birmingham. MARCH 22: CONCERT: Ulrich Schnauss, St,Luke's Church, Brighton. MARCH 23: CONCERT: Ulrich Schnauss, Gorilla, Manchester. MARCH 30: CONCERT: Ulrich Schnauss, The Art School, Glasgow. Unreleased material issue by Universal. Full details TBC.